Americas gateway to the universe. Leading the world in preparing and launching missions to Earth and beyond.March 5, 1999 John F. Kennedy Space CenterVol. 38, No. 5 Spaceport News In 10 months, is your software going to party like its 1899? This question kicks off an ad for a software company, but its clever query reminds us of a particularly persistent pest for everyone the Y2K bug. The Y2K (or Year 2000) software bug arises from computer programs using only a two-digit field to identify years (e.g., 78 = 1978) and assuming only a single century the 1900s. Computers, therefore, when the clock strikes midnight on Jan. 1, 2000, will attempt to read as the year 1900. Although traveling back in time can be pretty fun in the movies, it can wreak havoc inside a computer. If processors fail to recognize the as an actual value, they may get stuck in an endless loop looking for a viable value, causing machinery and electronic systems to stop functioning. Or, systems may recognize the value as 1900 or some other previous date (many default to 1980), destroying the integrity of electronic billing systems and time management systems that rely on accurate dates and times to function properly. In order to ensure KSCs smooth transition into the new millennium, Y2K Project Manager Art Beller is working on this issue that comes up, well, once in a century. But his deadline is more imminent. KSC is now working on finding and fixing all possible Y2K-relatedY2K & KSC: The computer countdown of the millenniumproblems by Mar. 31 this year, Beller noted. That is a government-wide deadline determined for NASA and other agencies by the Office of Management and Budget [OMB] in order to allow nine months of operating time to establish confidence in the systems. Bellers group is actively working toward the goal of (See Y2K, Page 3)Apollo-era high altitude chamber reactivated The Apollo 11 spacecraft command and service modules were tested in the Operations and Checkout Buildings altitude chamber in 1969. Segments of a workstand, used to work near the top of the spacecraft, are seen here lifted and pulled back against the circular walls of the chamber. Apollo 11 carried Neil Armstrong, Edwin Aldrin and Michael Collins to the moon for mankinds first lunar landing on July 20, 1969. Out of action for more than 20 years, one of two Kennedy Space Center high-altitude chambers formerly used to test Apollo Program flight hardware has been reactivated for use in leak testing International Space Station (ISS) pressurized modules. Use of the chambers first began in 1965 at KSC to test the Apollo command service modules and lunar service modules. They were last used in 1975 in support of the Apollo-Soyuz Test Project missions. In 1985, the pumping equipment and control room were removed and scrapped, and the chamber sat unused until now. In 1997, in order to increase the probability of successful missions aboard the ISS, NASA decided to perform leak tests on ISS pressurized modules at KSC. Reactivation of the west altitude chamber in the Operations and Checkout Building (O&C) high bay was determined the most practical and feasible option for the procedure. (See Chamber, Page 2) The chamber, 33 feet in diameter and 50 feet tall, is constructed of stainless steel. The rotation handling fixture, which holds the module, is aluminum. After installation of new vacuum pumping equipment and controls, a new control room and a newX marks the spot NASA recently released this Hubble Space Telescope near-infrared picture of a disk around the star HD 141569, located about 320 light-years away in the constellation Libra. The telescope photo shows that the 75 billion-mile-wide disk seems to come in two parts: a bright inner region that is separated from a fainter outer region by a dark band. It superficially resembles the largest gap in Saturns rings (known as the Cassini division). Astronomers using the Hubble Space Telescope are excited to find this dark gap dividing an immense dust disk around a young, but fully formed star like a wide groove in a phonograph record. One theory is that a planet may have gravitationally carved out the 3.7 billionmile-wide rut. The vast disk is 75 billion miles across, or about 13 times the diameter of Neptunes orbit. The inner edge of the gap is 21 billion miles from the star. Though already a fully formed, adult star, HD 141569 is relatively young, probably only one percent through its lifetime as a stable star. The star is nearly three times more massive and 22 times brighter than our Sun. 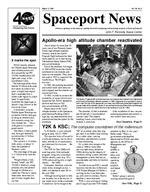 SPACEPORT NEWSPage 3 March 5, 1999Y2K ...(Continued from Page 1)assuring that all software, hardware, communications and networking at Kennedy Space Center is Y2K-compliant. Bellers group completed an initial inventory of Y2K non-compliant systems in 1997 and a subsequent inventory of all Y2K-vulnerable items early this year at KSC. This total inventory includes launch and payload processing systems, laboratory test equipment, desktop computers, fax machines, printers, fire suppression systems and power monitoring systems, among others. Inventorying items has allowed us to identify and fix the problems and to further mitigate risk by certifying already compliant items, said Beller. According to Beller, fixing the Y2K problem isnt a technical issue. Fixing the date problem internally in computers isnt difficult, once we knew where the fix needed to occur, Beller pointed out. It was finding all of the embedded dates in the wealth of old computer code that exists across the center that was the challenge. So the center embarked on a finding and fixing mission in six phases, starting back in 1996. The first stage was awareness. Awarenesss is key to the whole issue, Beller noted. Until Year 2000 awareness filtered down to everyone, it wasnt going to get done. It needed to be a proactive effort. The second stage was to inventory all systems at KSC, which included locating and listing every system that needed to receive a technical fix for Y2K compliance. All systems were inventoried over the past two years, and remediation quickly began. Remediation basically means fixing the problem, either by replacing, repairing or retiring the culpable item. Once fixed, the system can then be validated (or checked), put back into productional use and then certified, which places a final stamp of approval on the system as Y2K-compliant. By Mar. 31, all KSC systems will have been certified as Y2K-compliant. At present, we have eight mission-critical systems at KSC and four have been certified, Beller noted. The other four will be certified by the end of March. Thats a pretty good record, which mirrors a recent OMB quarterly progress report for NASA overall. The report, dated Feb. 15, stated that in the entire Agency, 87 percent of a total of 157 mission-critical systems have been made Y2Kcompliant. More than 52,000 workstations and file servers in NASA were tested for computer chip problems associated with Y2K. The report stated that corrective actions have been made to approximately 92 percent of nonmission-critical systems needing repair. At KSC, of 122 non-mission-critical systems, 110 were certified as of Jan. 31. One hundred twenty have been renovated and validated, with 115 of those systems put back in productional use, awaiting final certification. End-to-end testing and simulations for the Space Shuttle are currently planned for the April to July 1999 time period, Beller added. End-to-end tests involve a thorough systems check to see how input, processing and output is functioning. In the next few months, end-to-end tests will involve the Mission Control Center in Houston, the Mission Control Center in Moscow, a Shuttle vehicle on the launch pad here at the Kennedy Space Center, launch facilities, launch support facilities and the space operations networks necessary to support these tests, Beller said. Its very thorough. Prior to this testing, KSC will receive Shuttle data tapes from Johnson Space Center that will include measurements and information as if for a specific launch. Together, the centers will simulate a launch, akin to the Terminal Countdown Demonstration Tests that Kennedy Space Center runs periodically. During these tests, however, the centers will roll the clocks forward to simulate a future launch and test all systems to see how they function. Y2K end-to-end tests for the International Space Station are scheduled to be complete by July 1999. The Agency anticipates a total cost for the Y2K problem of about $46.7 million, of which KSC costs to date add up to approximately $5.5 million.KSCs All American Picnic approaches The 1999 KSC All-American Picnic will be held on Saturday, Apr. 10, from 10 a.m. to 4 p.m. at KARS Park 1. The picnic is open to all KSC employees, their families and friends. Ticket prices are $4 for adults (ages 13 and up) and $3 for children (ages 3 to 12). Tickets purchased the day of the event will cost an additional $1. Ticket price includes admission to the picnic, a meal, drinks, rides, games, contests, entertainment and a lot of fun! Check out KSCs Picnic Web Site on the KSC Internal Home Page for more details on the Childrens Carnival; Sports Activities; Kids Fishing Tournament; Wildlife Encounter/Zoo; Cultural Cuisine; Car Show; and Entertainment. Volunteers are needed in all areas. If you would like to volunteer to assist in any way, please contact Cindy Coddington at 867-3758 or Wanda Redmond at 861-3510. Tickets are now on sale. You can purchase tickets at NASA Exchange Retail Stores or by contacting the following individuals: Ken Williams, 867-1624, Hypergolic Maintenance Facility, TR622; Lynn Cassell, 861-1022, Orbiter Processing Facility HB-1, Mezzanine, Room 241; Peggy Bennett, 861-5254, Logistics Facility, K6-1547, Room 1775; Debbie Norris, 799-7001, NASA Shuttle Logistics Depot (NSLD) 2, Room 614; Jerri Thews, 861-6333, Vehicle Assembly Building, Room 2K12; Linda Lee, 861-0100, Pad A; Pat Mecouch, 853-7587, Hangar AF; Peggy Parrish, 476-4000, Hangar I Annex, Bldg. 55150, Room 204; Tiffany Nail, 853-5081, Engineering and Operations Building, Cape Canaveral Air Station, Room 200; Carol Swem, 799-5527, NSLD 1, Room 420; Cecilia Reid, 861-1340, Launch Control Center, Room 2R13. John F. Kennedy Space Center Managing editor. . . . . . . . . . . . . . . . . Bruce Buckingham Editor. . . . . . . . . . . . . . . . . . . . . . . Susan Maurer Editorial support provided by Information Dynamics Inc. Writers Group. NASA at KSC is on the Internet at http://www.ksc.nasa.gov USGPO: 733-112/80026Spaceport News Spaceport News is an official publication of the Kennedy Space Center and is published on alternate Fridays by the Public Affairs Office in the interest of KSC civil service and contractor employees. Contributions are welcome and should be submitted two weeks before publication to the Media Services Branch, AB-F1. E-mail submissions can be sent to Susan.Maurer-1@ksc.nasa.gov SPACEPORT NEWSMarch 5, 1999 Page 4 STS-93 crew visit at KSC rings a bellLast month, the STS-93 crew visited KSC to get a close-hand look at their payload, the Chandra X-ray Observatory, and while her e, they toured KSCs Space Shuttle Main Engine Facility. Above, Commander Eileen Collins (left) and Mission Specialist Catherine Coleman get a close-up look inside the bell of an engine. Standing on the ground are, left to right, Mission Specialist Michel Tognini, representing Frances Centre National dEtudes Spatiales; Pilot Jeffrey Ashby; and Mission Specialist Steven Hawley. STS-93, scheduled to launch July 9 aboard Space Shuttle Columbia, has the primary mission of deploying the Chandra X-ray Observatory, the world's most powerful X-ray telescope. Chandra will allow scientists from around the world to see previously invisible blac k holes and high-temperature gas clouds, giving the observatory the potential to rewrite the books on the structure and evolution of our universe. STS-93 will also be the first Shuttle mission commanded by a woman. Womens History Month luncheon In celebration of Womens History Month, the Federal Womens Program Working Group will host a luncheon on Mar. 12 from 11:30 a.m. to 1 p.m. at KSCs Visitor Complex Lunch Pad. The topic, Women Putting our Stamp on America, will be addressed by Guest Speaker Julia Anita, director of Protocol Essentials in Windermere, Fla. The luncheon will include ziti, fettucini alfredo, salad and a beverage for $8.50. Tickets can be purchased from Jean Rhodes at 8672307, Valarie Franklin at 867-7051, Kim Boatright at 861-3801 or Connie Dobrin at 861-5317. The KSC Coordinator for SEARCH is Tracy Young and the coordinator for EarthKAM is Denise Coleman, both with theStudents ...(Continued from Page 2)Center for Space Education. The teleconference was a natural fit between the programs and NASAs goal to introduce students to various elements of aerospace technology. African American History Month celebratedCenter Director Roy Bridges, right, celebrated African American History Month with employees at the Black Employees Strategy Team African American Breakfast held Feb. 18 in the Apollo/Saturn V Center. A breakfast buffet was served to attendees, followed by a program in the Lunar Theater. Major General Titus Hall, USAF (Ret.) was the guest speaker. Hall is founder and chairman of STARSAT 1200, Inc., an organization trying to improve the Scholastic Aptitude Test program.